Cruise lines advise flying into a departure port city the day before a cruise begins. This is excellent advice, especially in the winter, when weather can cause flight delays. But, this traveler has no interest in wasting an entire day on travel. So, my search began for somewhere interesting to go at a modest price, with no need for a rental car. My find? 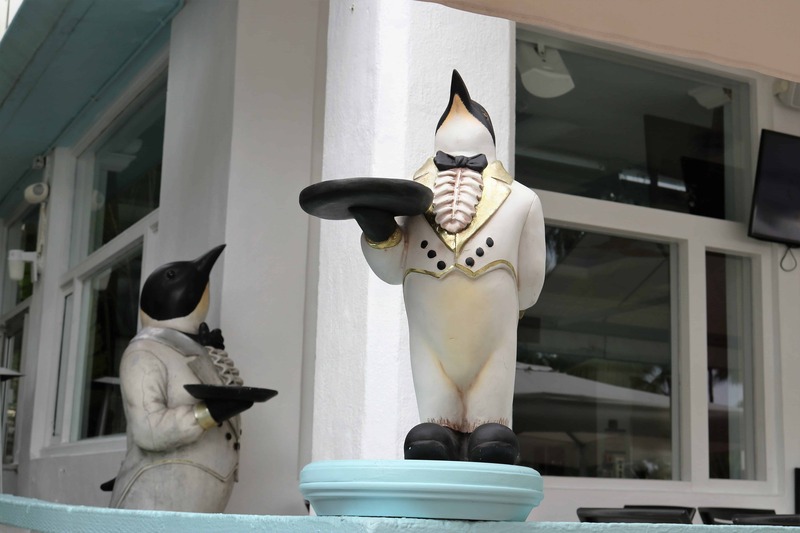 The Penguin Hotel in South Beach. 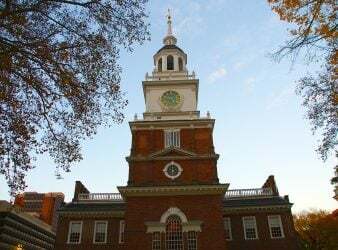 You see, when you leave Ohio in February to fly to Florida, all that really matters is that the sun is shining. 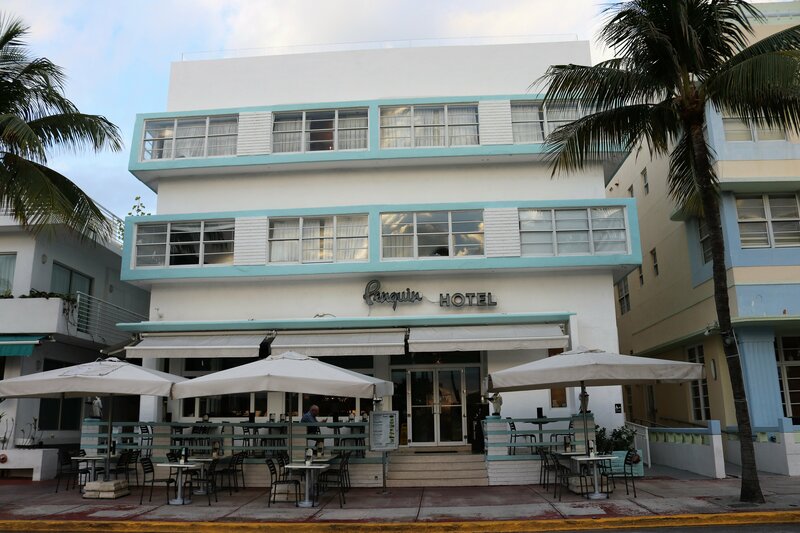 With a worldwide reputation as a hot spot for nightlife, fabulous beaches, 1940’s Art Deco architecture and a playground for the rich and famous, Miami Beach, and particularly South Beach, can be crowded and expensive. Hotels are mostly older, but constantly being renovated. There is a lot of demolition and construction, but the Art Deco District seems focused on preservation. Location, amenities and condition dictate price, so choosing carefully to meet the objectives of the trip are important. With just two nights and a desire to increase our vitamin D levels with natural sunshine, we wanted to get some rest before we spent three nights and four days on a cruise ship in the Caribbean. I was in search of a hassle free experience at a good price. I love unique, locally owned hotels, but they can sometimes be difficult to find. I found many of the local, unique Art Deco properties online. Trip Advisor, a MilesGeek affiliate, was the next place to look, to see what current reviews had to say about the property. 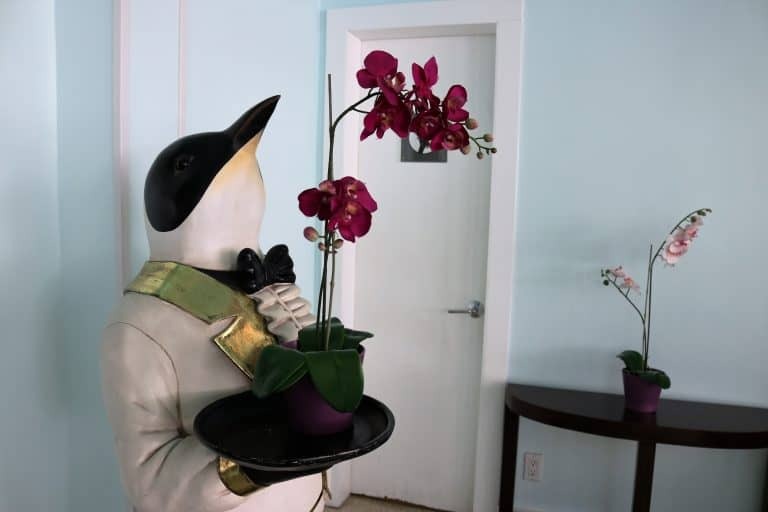 I was surprised to find The Penguin Hotel, right on Ocean Drive, wedged between the luxurious Betsy Hotel on the North end of the block and the Marriott Autograph Collection Winter Haven to the south. How can a hotel in this neighborhood be less than $150 per night when its neighbors want significantly more? Going “cheap” is not always the answer, if the incidental charges add up. In this case, The Penguin Hotel was looking good. We Ubered to the hotel from the airport and from the hotel to the Port of Miami. Our Uber fares for each trip were in the $10-$20 range. Not bad for door-to-door transportation for two people. This met my criteria for avoiding a rental car and hefty parking charges. Another incidental charge to be aware of is the Resort Fee. At The Penguin, it was $19 per room, plus tax. Some hotels charge a per person resort fee, so the per room fee was very reasonable. At The Penguin, the resort fee included free WiFi, a generous continental breakfast for two in the morning, a welcome cocktail on our first day, two bottles of water daily, and fresh beach towels each time we walked across the street to the beach. Even better, there was a bin in the lobby to throw sandy beach towels when we returned. This process kept the beach sand out of the hotel room. There is nothing more irritating than sand where it doesn’t belong at a beach hotel. For Two Nights, What Do You Really Need? 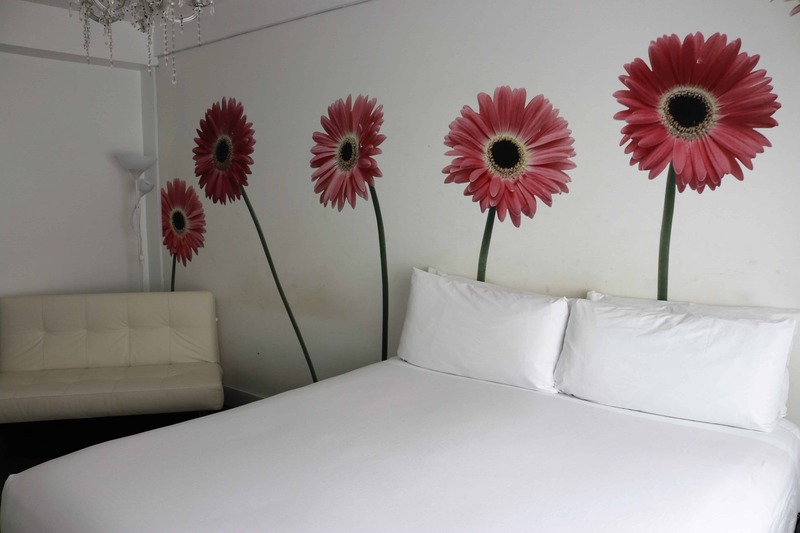 The Penguin Hotel was originally built in 1948 by Henry Hohauser as The Golden Dawn Hotel. Renovated in 2006, the hotel holds up amazingly well in 2017. The 43-room hotel is what a hotel was in the 1940s, a decent sized room with a modest bathroom and closet. Walk out of the hotel and you cross Ocean Drive into Lummus Park before stepping onto the sandy beach. Oceanfront doesn’t get much better. But, open the curtains in the room, and the view is of the wall of the hotel next door. The crisp white bedding, crystal chandelier, white leather sofa and botanical themed wall painting were welcoming, inviting a good night’s sleep and a clean shower to freshen up after a day at the beach. Having a view of the wall next door meant the room was quiet and peaceful. We never heard street noise in the room. There is no swimming pool, but who needs a swimming pool with the Atlantic Ocean out the front door? 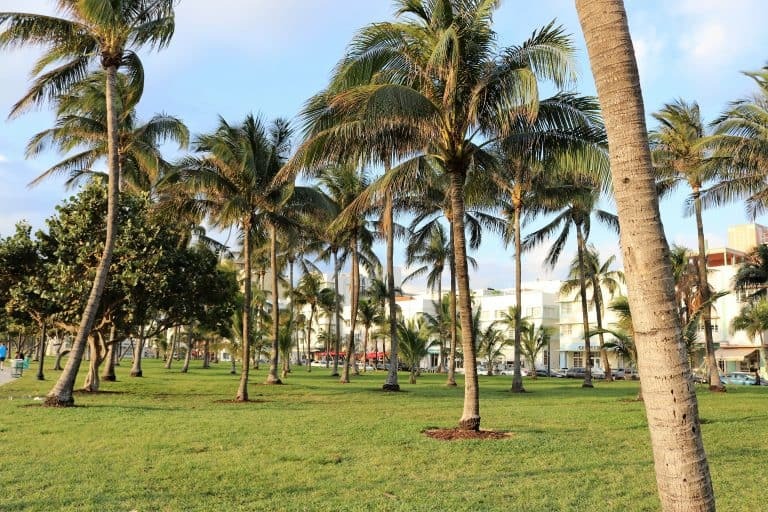 There is no workout room, but the beautifully paved and landscaped walking paths of South Beach connect to Lummus Park, and offer plenty of space for exercise. Morning and evening walks were on the agenda. People watching is quite entertaining on South Beach. 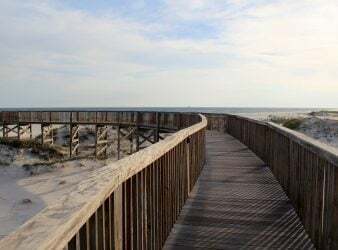 Long strolls are a great way to take it all in. The tiny elevator accommodated two passengers with luggage and no more than three with no luggage. The stairs were our preferred method to get to our second floor room. Exercise and no wait for the elevator were just fine with us. An inconvenience? Not really. Just a reminder of the era in which the hotel was built. The hotel reminded me of many old European hotels. The ambiance of the restaurant and café were calm and relaxing at times, and filled with hustle and bustle at other times. There was a nice balance of Cuban influence, local seafood and southern hospitality. Listening to the table conversations I heard Spanish, French, German, Dutch, Chinese, Japanese, and a few languages I didn’t recognize. As an American who loves to travel the world, I am thrilled when I find international places to travel with a domestic flight. It truly feels like an international trip in my own country. My natural inclination is always to seek out a variety of local restaurants. 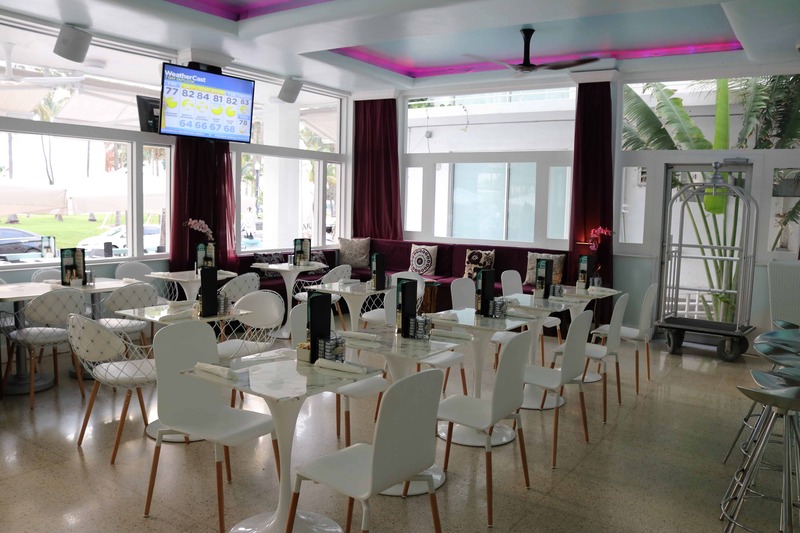 However, if the objective of a South Beach getaway is rest and relaxation, there is no reason to leave the hotel. The Purple Penguin Café and Bar offered indoor, porch and street side seating. The food service was simple, with daily specials offered. The food was fresh and delicious. With access to great produce, especially amazing avocados for the guacamole, you can’t go wrong. 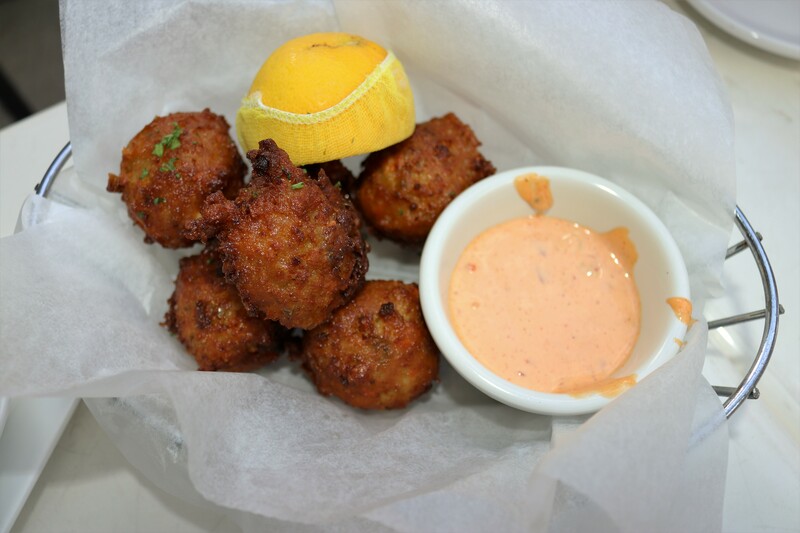 The conch fritters were a vacation indulgence worth the splurge. 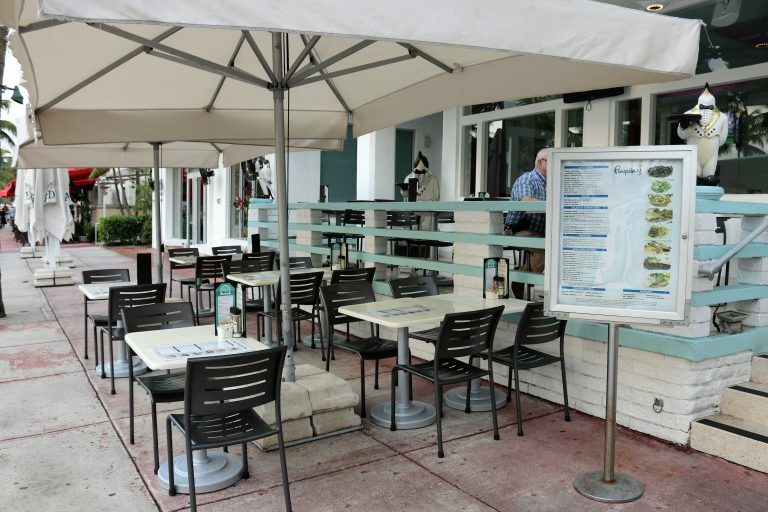 The restaurant relies on the heavy foot traffic from the street, but let your waiter know you are staying at the hotel, and your food bill will be discounted. Of course, it is always the hospitality, not the era of the physical building that makes a hotel stay enjoyable. Weeknight rates are less expensive than weekends. The beaches and restaurants are also less crowded on weekdays. 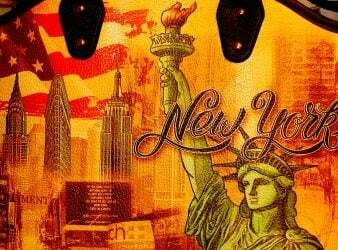 Booking directly with the hotel can also save ten percent or more. Due to the dense population, parking is difficult and expensive on Miami Beach. Avoid driving if possible, and opt for a cab or Uber in the rare instance you can’t walk to where you want to go. Thanks for the story, Victoria! I will be heading there soon myself. Two nights like yourself. They have the best reviews for the cost. Awesome information, thanks for sharing!